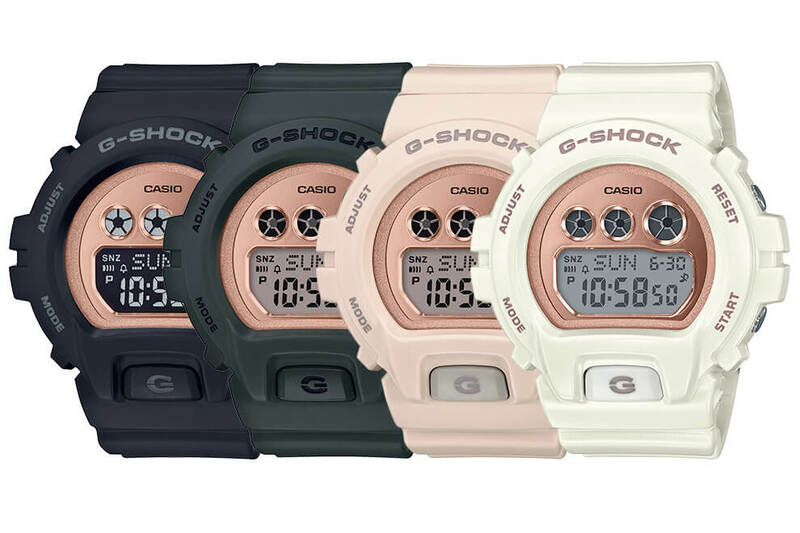 The launch of the G-Shock GMDS6900MC Metallic Mirror S Series is surprising considering that we haven’t seen a new GMD-S6900 watch for years and feared that this digital G-Shock line for women was discontinued. Also surprising is the fact that this new series was first announced by Casio America before Japan and Asia. 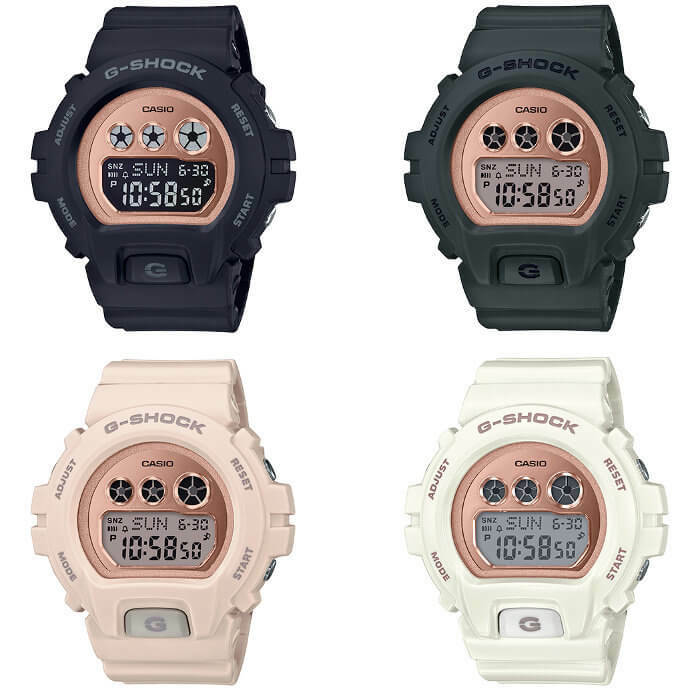 Models include the GMDS6900MC-1 (black), GMDS6900MC-3 (military green), GMDS6900MC-4 (blush), and GMDS6900MC-7 (white). Each model features a metallic mirror rose gold face and a rose gold display ring. The black model has a reverse LCD display and the green and blush models have a standard LCD display with a rose-tinted background. The white model has a standard LCD display with no tint. The rose gold faces are highly reflective and manufactured with the newly created vapor deposition process that we’ve seen on other recent Metallic Mirror G-Shock models like the DW-6900MM and DW-5600BBM/DW-5700BBM series. The video below does a better job than the photos of displaying the reflective properties of the watch face. The GMDS6900MC is a smaller 46 mm-wide version of the classic G-Shock DW-6900. Features include shock resistance, 200-meter water resistance, world time, 1/100 second stopwatch, countdown timer, 2 alarms and 1 snooze alarm, flash alert, and EL backlight with afterglow. The GMDS6900MC watches have a list price of $99 USD each. They are currently listed on gshock.com and should be available to purchase soon. Update: The GMD-S6900MC-1, GMD-S6900MC-3, GMD-S6900MC-4, and GMD-S6900MC-7 are also Asia releases in September 2018.